Don’t miss this wild variety of 20 minute plays! Directed by Advanced Drama Directing Students and acted in by first and second year students there are over thirty-six plays with over a hundred actors rotating over eleven nights. From plays written by Tam students to word for word renditions of short stories to famous classics, this one act season could not be more fun. 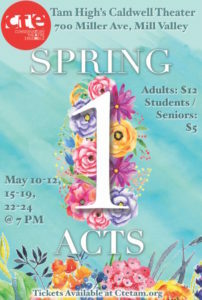 All performances are at the Daniel Caldwell Theatre located at the back of Tamalpais High School’s campus (near Almonte/Stadium) where there is plenty of parking available in the back parking lot. Tickets are available online here, or at the door. Prices are $5 for students and senior citizens and $12 for Adults. CTE students are admitted free, with a suggested donation of $5. Non-reserved seating. Doors open at 6:30 to claim your seats on a first-come, first-serve basis.